The Acts of the Apostles is the second part of Luke’s masterpiece history of the life of Yeshua and the first generation of the Church and its leaders such as Paul and Peter. Besides being a book of history, however, it is also a Spirit-inspired work that contains many important lessons for the Church of today, especially for those believers seeking the Restoration of the Church with its Jewish Roots. This commentary will help the scholar or layperson seeking to navigate the colorful cultures and contexts of the ancient Mediterranean world to which the apostles spread the message of Yeshua and understand the “how” and the “why” of their methods of spreading an essentially Jewish faith to a pagan world. Shulam and LeCornu especially highlight the importance of the Diaspora Jewish context and its influence on the early Body of Messiah through comparing the beliefs and statements found in Acts to other ancient Jewish sources and ideas. As the reader journeys through the complexities and cultural contexts of the ancient world portrayed in Acts, he discovers that it still contains a wealth of parallels and lessons for our own time and culture. A deeper and richer understanding of the first followers of Yeshua the Messiah awaits those who truly investigate the Acts of the Apostles in this two volume set that will stir anyone’s thirst for greater knowledge of the Bible and its Jewish context. 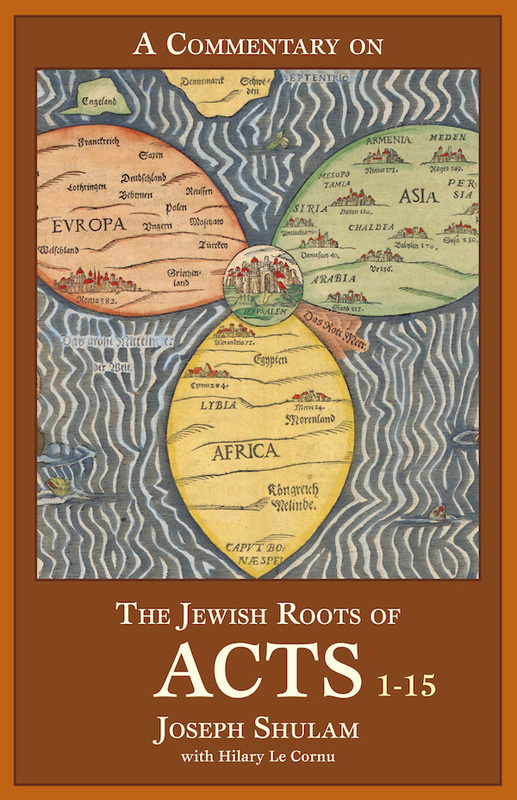 This excellent volume by Hilary Le Cornu and Joseph Shulam thoroughly documents the Jewish milieu of Acts and its influence on the composition of the book. It is masterfully written, carefully researched, saturated with documentation from every relevant Jewish source and penetratingly analytical of the linguistic nuances of Greek and Hebrew vocabulary in Acts … It belongs in the library of everyone who wants a scholarly, well written source for a serious study of Acts. I highly recommend it. This new definitive commentary on the Book of Acts broadens the horizon for the historical and critical research of the blossoming of Christianity from her historic roots in ancient Judaism. This excellent new work explores all the relevant sources, including the rabbinic literature, which will shed valuable light upon the beginnings of the early church. It is sure to be a foundational work for all future research. Hilary Le Cornu’s and Joseph Shulam’s commentary on Acts has set a new standard … for understanding the whole Jewish milieu in the first half of the first century of the Common Era. The commentary masterfully weaves rabbinic, classical, Scriptural, and Dead Sea sources into the tapestry of the book of Acts. No informed scholar of the late Second Temple period, or of the Gospels and Epistles, can afford to be without this work. In this sequel to A Commentary on the Jewish Roots of Romans the authors continue to contextualize the New Testament in their first century Jewish setting. Comprehensive in scope, it provides solid scholarship in proven areas and offers fresh and challenging insights into texts with which we thought we were already familiar.